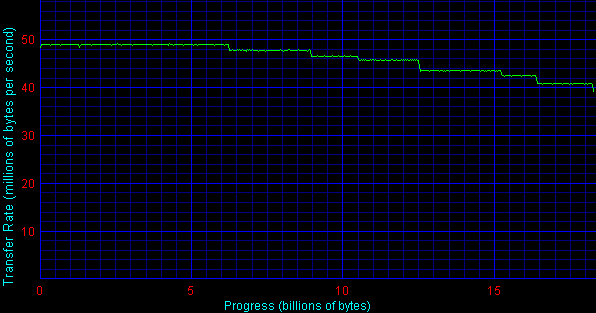 Today we are dealing with one of the fastest storage devices. 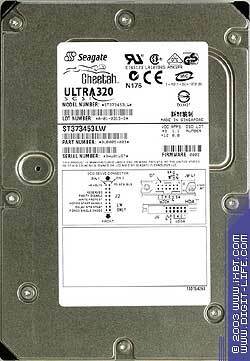 As you can see from the name we will talk about Seagate's Cheetah 15K.3 disc. Let's see if its performance justifies its name. Before we proceed to the tests let me answer some questions of our readers who complain that some reviews get published too late. Well, you are right, the SCSI disc section wasn't updated for almost a year, and now we are going to repair the omission. Here are the drives to be tested: Seagate Cheetah 15K.3 ST373453LW, IBM Ultrastar 36Z15 IC35L018UWPR15 and Seagate Cheetah 10K.6 ST373307LW. The IBM's drive is not new, it came to the scene a bit later than the previous generation of Seagate's 15K drives. The Cheetah 10K.6 was given birth to at the same time with the today's hero, but was originally positioned as a less efficient solution. That is why these two discs will hardly demonstrate enough strength to beat the Seagate 15K.3, they will just effectively emphasize its advantages. However, I must say that lack of strong rivals never was a good motive power. The drive incorporates the 3D Defense System where 3D stands for DDD - Drive Defense, Data Defense and Diagnostic Defense. Also it supports the SeaShell technology (shockproof), and SAMS (Seagate's Advanced Multidrive System). 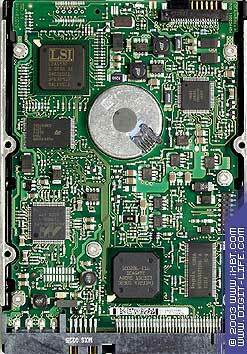 The Seagate drives were tested with the firmware 0002. The test programs are standard. I'd like to thank those our readers who pointed out that we kept on using the SCSI controller with driver v1.1 in spite of the v1.3 and v2.0 available (but Adaptec's official site keeps silence about these drivers). In the near future we will use the new drivers to test the tandem of the Seagate Cheetah and Adaptec which demonstrated a deviant character last time. As expected, our hero shows the best maximum and minimal data rates. Noteworthy is the fact that the IBM Ultrastar isn't able to reach at least the minimal data rate of Seagate's new solution. Judging by the disk transfer rate diagrams, the average rate results become easily predictable - even the 10K model outscores the IBM. The higher-level Cheetah is up in the clouds, its superiority is doubtless. The access time is predictable - just add the average access time to the latency from the table and you will get something similar to the above figures. In the FAT the new solution takes the leading positions, but in the NTFS its scores markedly fall down. I must say that all hard drives have lower scores in the NTFS , but all Seagate drives starting from the low-level ATA and Serial ATA to SCSI 10000 rpm and 15000 rpm drives spin down by a great margin. I hope the guys at Seagate will solve these problems in the next generation of drives. Besides, most SCSI discs are formatted exactly in the NTFS. First I want to attract your attention to these diagrams from the aesthetic standpoint - such an unexpected pile of lines at the verge of abstractionism doesn't take place that often. Look at them - what ideas come to your mind? Now let's have a professional look at these diagrams. First of all, both Cheetah have the same character. 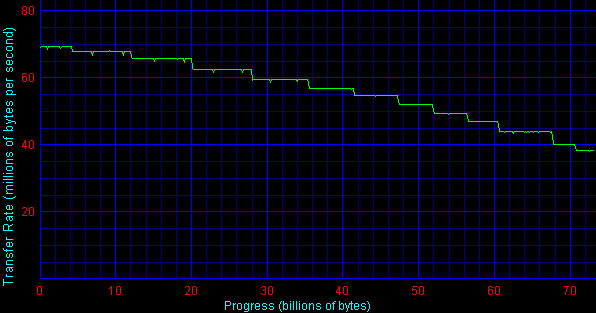 Moreover, their performance drop down at the queue length of 64 bits (Moderate) (look for the details here). Secondly, in the patterns with a large number of reading operations (Web-server and Workstation) at low loads the performance of both 15K models looks very similar. In those patterns where writing operations prevail the IBM beats both Cheetahs. Thirdly, the IBM's old chap maintains its reputation at the random writing, and both 15K models share the first place. Below are the scores of both Seagate's drives in the Database pattern for different loads and different read/write ratios. The higher the load, the better the 15K drive looks. In the series read/write operations both drives go on a par, and only the 15K.3 outruns its junior brother in the right part of the diagrams (i.e. at the block size of 16 KB and over). This Seagate's solution looks pretty successful, and it can be considered one of the fastest hard drives for today. But the progress goes on, and at the end of the spring Fujitsu and Maxtor also released their 15K models. I hope we will soon get them for the tests. Who knows, maybe Seagate's loopholes will "help" high-end drives of this company lose their leading position and step down the ladder. 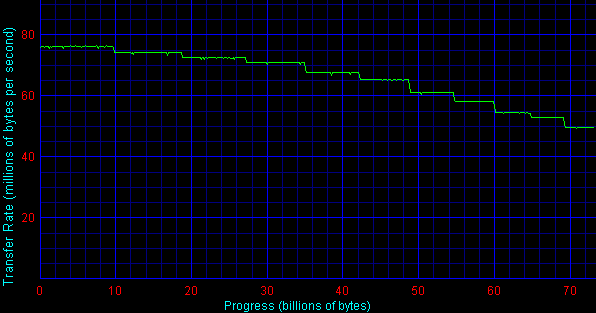 On the other hand, I hope the engineers at Seagate will do their best to do away with these problems.